But after finishing the piece, I worried that Greg was right. Doubt had crept into my writing process like it does just about every month. I lose the ability to discern whether my personal essays and memoirs will spur smiles, indifference, or yawns. I’m a practical person. I know that none of my writing will ever be perfect, that’s just not possible. So at the very least, I aim to entertain. Then I revise as much as possible before having to part with my little darlings—my painstakingly crafted articles. Pushing deadlines and my editor’s patience, I eventually let go and watch my little ones fly. This month, after three long days of trying to improve my article and after going off on tangents into unrelated topics, I realized that even I was disinterested with what I had written. Friend and fellow Deadwood Writer, Diana Hirsch, says “blogging is supposed to be fun.” The first time she said it to me was when I was struggling to transform my jumbled thoughts into a structured idea that wouldn’t put readers to sleep. She may have presumed I wasn’t enjoying the creative process, but that wasn’t the case. I can . . . and do . . . sit for hours writing, because I like most everything about it. Introspectively, I analyze relationships and reflect on life. I savor the peace and quiet of researching and indulge in sipping coffee throughout the day. I thrive on the challenge of organizing my material into something clever and orderly; of shaping stories, revising them over and over. And—just like I adore holding a book and flipping pages—I love printing my finished articles so I can pass them between my fingers too. I lay the pages out, scan them for errors, and dot them with red ink where needed. I’m sorry for the trees I murder. But there is something wonderful about the feel of crisp paper with knife-like edges; the sight of black ink being constrained by white, one-inch margins; and the sound of pages clicking in place as I line them perfectly on top of one another and then bring them together with a swift tap or two against the surface of my desk—prepping them for stapling in their upper-left corners. My little darlings are unlike other writers’ self-indulgent brats—superfluous material, screaming to be cut out from the current body of work and saved for a more befitting purpose. My babies comprise the entire article in its imperfect yet finished form. They are born from each letter and every punctuation mark I type and handcraft with love for you. Dear readers, you are the driving force behind my efforts to raise good children. I want you to find something encouraging or useful in what I write. 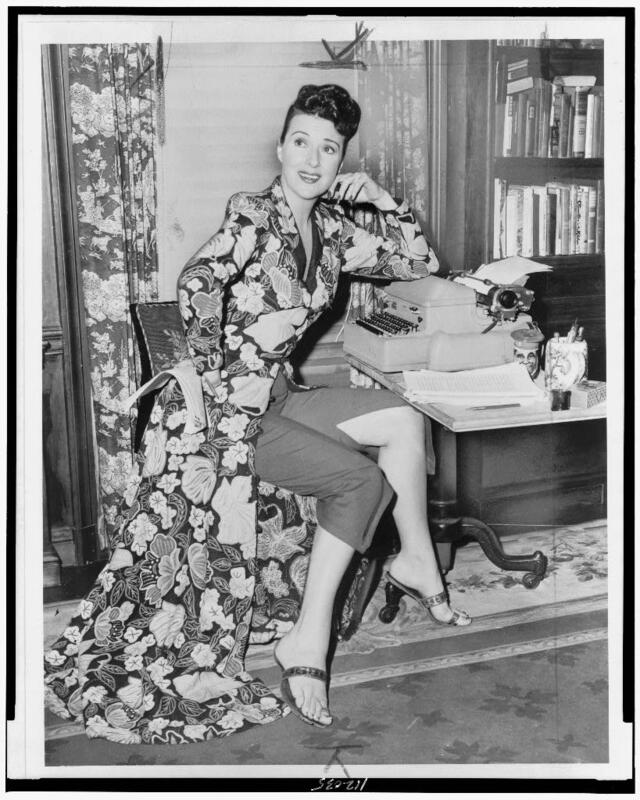 If I can entertain you or make you smile at some point, I’m ecstatic, but I’m about as far from Gypsy Rose Lee as one can be. I’m not a natural showgirl or a well-known author. I’m a writer battling against mediocrity in my blogs. Many of Hollywood’s leading ladies have stepped onstage to sing the lyrics to the iconic “Let Me Entertain You.” The song was inspired by Gypsy Rose Lee’s popularity as a burlesque dancer. This is how I like to remember her: as an author. Imagine: A prisoner, whose only chance for escape involves crossing a line that’s being guarded by expert shooters. He knows that crossing that line will most likely result in his death. He frets. He schemes. He hopes. He commits, knowing there is no turning back. No return; no surrender. There is no undoing what he’s about to do. At best, he’ll succeed and live a long life on the run. But doubt creeps in as he faces the fact that his attempt at freedom—at crossing the deadline—will probably result in death. This month, I hope you’re relieved to find out that you don’t get to read a boring account of the iPhone I stumbled upon while Christmas shopping . . . just because I have a deadline. I’m preserving any good impression you may have of me by killing my darlings. I think we can put a lot of pressure on ourselves with self-imposed deadlines. Some that can’t be avoided are imposed by others. The ones I impose on myself serve to keep me from being lazy. I’m trying to get back to writing again after two weeks down with the flu. Getting out of the writing habit makes coming back difficult. Little by little I’m getting back to posting on my blogs, realizing they won’t be all I hoped for at first. What is important now is the act of writing again. I’m thankful blog posts can be edited and improved as time goes on. Hi Barbara. I was excited to read your comment. Most of the people I engage with are people I already know. So, hello and welcome! I’m glad you’re feeling better and getting back to writing. It’s what we long for, isn’t it? How often do you post on your site and what do you write about?